Mexican Wedding Cookies are a pastry-like cookie that are very popular for weddings and as holiday treats. These cookies are also referred by other names, such as Biscochitos, Butterballs, Polvorones, Melting Moments or Russian Tea Cakes. The ingredients for this recipe are simple: ground nuts, flour, sugar, salt, butter and vanilla extract. 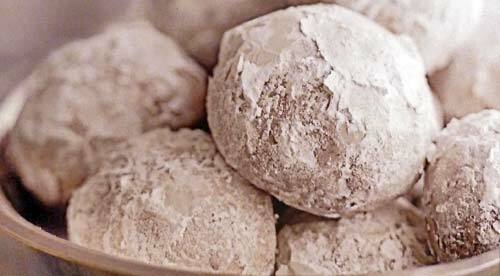 Once baked, they are coated in powdered sugar which adds a nice sweet finish. The combination of butter and pecans work together to create the rich flavor and melting texture of these bite-sized cookies. The perfect sweet treat to accompany your afternoon coffee or tea. Position one of your oven racks in the middle of your oven and preheat oven to 325F degrees. Line your cookie sheets with parchment paper or silicone liners. In a small bowl, sift together the flour and salt then set aside. In a food processor, combine the pecans and 2/3 cup confectioners' sugar. Pulse to chop the nuts coarsely, then process until finely ground, about 2 minutes. In a large bowl, combine the butter, ground pecan mixture and vanilla. With electric mixer on medium speed, beat until well blended, about 1 minute. Slowly add the flour mixture and beat on low speed just until incorporated. Scoop up a level tablespoonful of the cookie dough and roll into balls between palms of hands. Place cookie dough balls on cookie sheet about 1 inch apart. Bake about 18-20 minutes, until cookie tops are lightly browned. Remove from oven and cool cookies on sheet for about 5 minutes. Transfer from pan to wire rack and cool completely. Sift 1 cup confectioners' sugar into shallow bowl. Lightly roll each cooled cookie in sugar and coat completely. Store in a covered airtight container at room temperature for up to 3 days. This recipe makes about 48 Mexican Wedding Cookies.